Watergate. The end of Vietnam. Normal relations with China. Earth Day. It was a nation in flux, one turning in small measures to a computer age, even if that computer was originally the size of a house. With the Senate vote in 1978 to return the Panama Canal back to Panama in 1999, the nearly one hundred year history of Washington's involvement in the canal would come to an end. 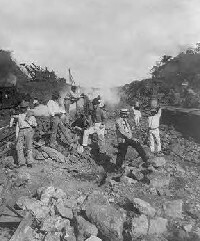 Photo: Panama Canal workers, circa 1906. Check out the Spotlights on History you may not know about, our monthly feature at America's Best History. 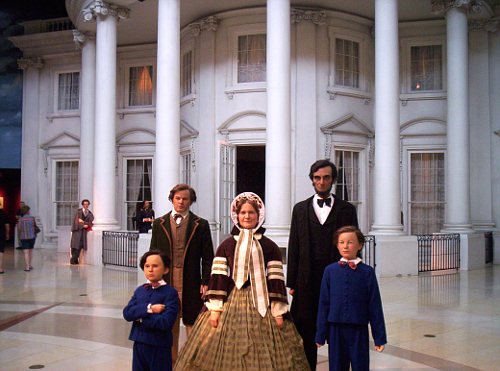 A visit to a Presidential Library can be an enlightening experience, allowing the historic tourist to emerse yourself in the life of a president, as well as the era of his presidency. 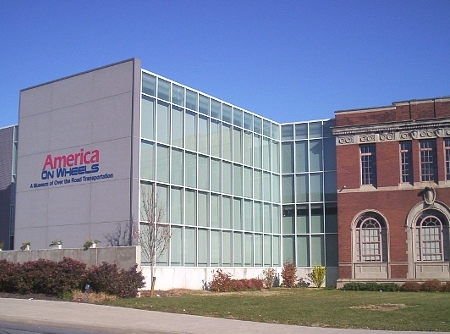 One of the truly remarkable ones is the Lincoln Presidential Museum and Library in Springfield, Missouri. 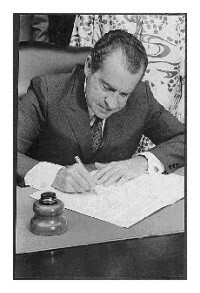 Photo above: President Richard Nixon. Courtesy National Archives. 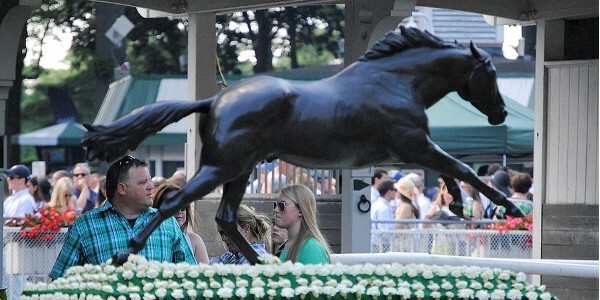 Right: Statue of Secretariat at Belmont Park, 2014, courtesy Wikipedia Commons. 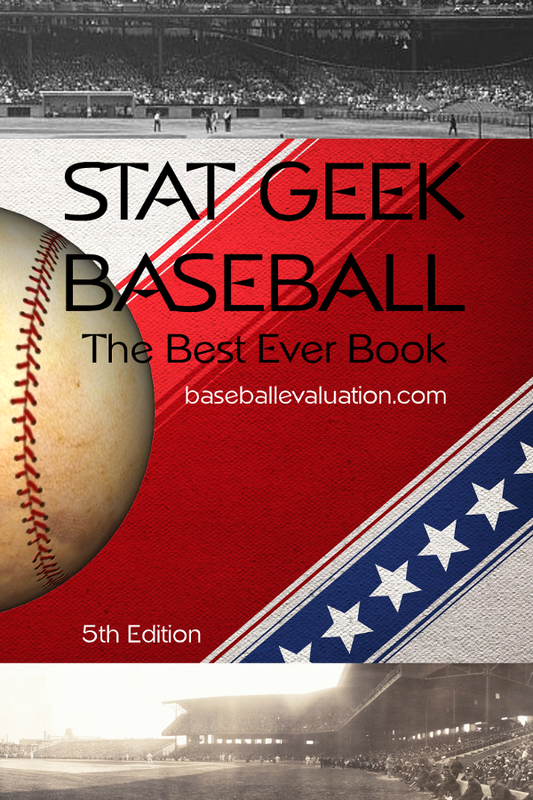 Sponsor this page for $225 per year. Your banner or text ad can fill the space above. February 18, 1970 - Five members of the Chicago 7 are convicted of crossing state lines to incite riots during the 1968 Democratic Presidential Convention in Chicago. April 1, 1970 - For the first time, the 1970 census counted over 200 million people living in the United States. The 13.4% increase since the last census indicated that a 203,302,031 population now called the U.S.A. home. It had taken only fifty years to go from the first 100 million census in 1920 to the second. Once again, the geographic center of the United States population was in Illinois, five miles east southeast of Mascoutah. April 22, 1970 - The first Earth Day celebration is held with millions of Americans participating in anti-pollution demonstrations. These demonstrations included school children walking to school instead of riding the bus. May 4, 1970 - Four students from Kent State University in Ohio were killed and nine wounded by National Guardsmen during a protest against the Vietnam War spread into Cambodia. August 12, 1970 - The United States Postal Service is made independent in a postal reform measure for the first time in almost two centuries. 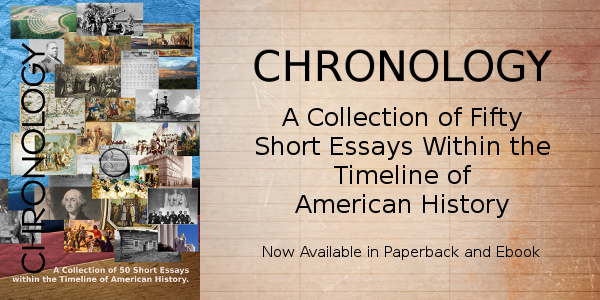 Great Book for the History Fan with Fifty Short Essays Telling the Story of American History. January 2, 1971 - A ban on the television advertisement of cigarettes goes into affect in the United States. February 8, 1971 - A forty-four day raid into Laos by South Vietnamese soldiers is begun with the aid of United States air and artillery. March 10, 1971 - The Senate approves a Constitutional Amendment, the 26th, that would lower the voting age from 21 to 18. House approval came on March 23. It was ratified by the states by June 30 and received certification by President Richard M. Nixon on July 5. June 30, 1971 - The United States Supreme Court upholds the right of the New York Times and the Washington Post to publish classified Pentagon papers about the Vietnam War, under the articles of the First Amendment to the Constitution. The New York Times had begun the publication of the Pentagon papers on June 13. September 17, 1971 - The advent of the microprocessor age at Texas Instruments includes the introduction of the 4-bit TMS 1000 with a calculator on the chip; on November 15, 1971, Intel released the 4-bit 4004 microprocessor developed by Federico Faggin. It is unknown whose chip predated the other in the laboratory environment. October 1, 1971 - Walt Disney World opens in Orlando, Florida, expanding the Disney empire to the east coast of the United States. February 21, 1972 - The journey for peace trip of the U.S. President to Peking, China begins. The eight day journey by Richard M. Nixon and meetings with Mao Zedong, unprecedented at the time, began the process for normalization of relations with China. March 30, 1972 - The largest attacks by North Vietnam troops across the demilitarized zone in four years prompts bombing raids to begin again by United States forces against Hanoi and Haiphong on April 15, ending a four year cessation of those raids. May 22, 1972 - President Richard M. Nixon makes the first trip of the U.S. President to Moscow. The week of summit discussions would lead to a strategic arms pact, SALT I that would be signed by Nixon and Premier Leonid Brezhnev on May 26. On July 8, the White House would announce the sale of American wheat to the Soviet Union. June 17, 1972 - The Watergate crisis begins when four men are arrested for breaking into the Democratic National Committee headquarters in the Watergate office building in Washington, D.C. on the same day that Okinawa is returned from U.S. control back to Japan. November 7, 1972 - In one of the most lopsided races in American Presidential election history, incumbent President Richard M. Nixon beat his Democratic challenger George S. McGovern, winning 520 Electoral College votes to McGovern's 17, and taking over 60% of the popular vote. This election, however, would be the beginning of the end for the presidency of Richard M. Nixon, once the Watergate affair brought question into the tactics within the election process. January 22, 1973 - The United States Supreme Court rules in Roe vs. Wade that a woman can not be prevented by a state in having an abortion during the first six months of pregnancy. January 27, 1973 - Four part Vietnam peace pacts, the Paris Peace Accords, were signed in Paris, France. The announcement of the military draft ending also occurred on that date. The last U.S. military troops would leave the war zone on March 29. January 30, 1973 - Two defendants in the Watergate break-in trial are convicted. The remaining five defendants had pleaded guilty to the crime two weeks earlier. On April 30, the Watergate affair widens when four members of the Nixon administration; aides H.R. Haldeman, John D. Ehrlichman, John W. Dean, and Attorney General Richard Kleindienst resign under suspicion of obstructing justice. During Senate hearings on June 25, Dean would admit that the administration had conspired to cover up facts about the case, leading to the refusal of the President to release tapes concerning Watergate. June 9, 1973 - In one of the most awesome displays of dominance in sports history, Secretariat, wins the Belmont Stakes by 31 lengths, winning the Triple Crown of United States Thoroughbred Racing for the first time since 1948. October 10, 1973 - Vice President Spiro T. Agnew resigns amid charges of tax evasion and is replaced by the appointment of Gerald R. Ford on October 12. October 19, 1973 - The Arab Oil Embargo: Oil imports from Arab oil-producing nations are banned to the United States after the start of the Arab-Israeli war, creating the 1973 energy crisis. They would not resume until March 18, 1974. March 7, 1974 - Legislation is signed by President Nixon creating the Big South Fork National River and Recreation Area along the Cumberland River in Kentucky and Tennessee. May 4, 1974 - Expo '74, the Bureau of International Exhibitions sanctioned special exposition was held for six months in the Washington State city of Spokane, one of the smaller cities to host a BIE world expo in their history. Held on the theme "Celebrating Tomorrow's Fresh, Clean Environment," the event capitalized on the Earth Day sentiments of the time, and drew over 5 million visitors to eastern Washington State. May 7, 1974 - Impeachment hearings are begun by the House Judiciary Committee against President Richard M. Nixon in the Watergate affair. On July 24, the United States Supreme Court rules that President Nixon must turn over the sixty-four tapes of White House conversations concerning the Watergate break-in. July 27, 1974 - The first of three articles of impeachment against President Richard M. Nixon is recommended in a 27-11 vote of the House Judiciary Committee, charging that Nixon had been part of a criminal conspiracy to obstruct justice in the Watergate affair. August 9, 1974 - President Richard M. Nixon resigns the office of the presidency, avoiding the impeachment process and admitting his role in the Watergate affair. He was replaced by Vice President Gerald R. Ford, who, on September 8, 1974, pardoned Nixon for his role. Nixon was the first president to ever resign from office. January 1, 1975 - The Watergate cover up trials of Mitchell, Haldeman, and Ehrlichman are completed; all are found guilty of the charges. January 6, 1975 - The television show Wheel of Fortune premiers. March 30, 1975 - At the railroad depot in Plains, Georgia, his home town, former Democratic Georgia governor Jimmy Carter opens his campaign headquarters for the 1976 presidential race. April 29-30, 1975 - Communist forces complete their takeover of South Vietnam, forcing the evacuation from Saigon of civilians from the United States and the unconditional surrender of South Vietnam. September 18, 1975 - Heiress Patty Hearst is captured after her year of kidnap and bank robbery in California. She would be convicted of the crime six months later. July 4, 1976 - The Bicentennial of the United States is celebrated throughout the nation. The 200th anniversary included Operation Sail in New York City, as well as a Bicentennial Wagon Train that traversed the nation during the year. July 20, 1976 - The Viking 1 space probe successfully lands on Mars. It would be followed by a second unmanned Viking II on the Utopia Plains on September 3. The first color photos of the surface of Mars are taken on these flights. July 21-24, 1976 - Twenty-nine people attending an American Legion convention in Philadelphia are killed by a mysterious ailment, one year later discovered as a bacterium. November 2, 1976 - Challenger Jimmy Carter, a relatively unknown former Democratic governor from Georgia, bests Gerald Ford in a closely contested election. Carter received a slight majority of the popular vote, as well as an Electoral College victory of 297 to 240. November 26, 1976 - Microsoft becomes a registered trademark, one year after its name for microcomputer software is first mentioned by Bill Gates to Paul Allen in a letter. January 21, 1977 - The majority of Vietnam War draft evaders, ten thousand in number, are pardoned by President Jimmy Carter. May 25, 1977 - The movie Star Wars opens and becomes the highest grossing film at the time. August 4, 1977 - The cabinet level Energy Department is created by Jimmy Carter. July 13, 1977 - The New York City blackout results in massive looting and disorderly conduct during its twenty-five hour duration. September 21, 1977 - Fifteen nations, including the United States and the Soviet Union, sign a nuclear-proliferation pact, slowing the spread of nuclear weapons around the world. March 3, 1978 - In one of the first articles on the subject of human cloning, the New York Post prints an article on the book The Cloning of Man which supposes the cloning of a human being. April 18, 1978 - The United States Senate votes to return the Panama Canal back to Panama on December 31, 1999. A treaty for the return had been signed on September 7 of the previous year, pending approval by the U.S. Congress. August 17, 1978 - The first balloon, Double Eagle II, to cross the Atlantic Ocean comes to rest in Miserey, France, after one hundred and thirty-seven hours of flight from Presque Isle, Maine. September 17, 1978 - The Camp David Peace Agreement between Israel and Egypt is formulated in twelve days of secret negotiations at the Camp David retreat of the President. President Jimmy Carter witnessed the signing of the agreement between Israeli Prime Minister Menachem Begin and Egyptian President Anwar Sadat at the White House. October 16, 1978 - Pope John Paul II, Karol Wojtyla of Poland, is elected Pope at Vatican City. March 28, 1979 - An accident at the Three Mile Island nuclear power plant in Middletown, Pennsylvania occurs when a partial core meltdown is recorded. A tense situation ensued for five days until the reactor was deemed under control. It is the largest accident in U.S. nuclear power history and considered the worst in the world until the Soviet Chernobyl accident seven years later. September 1, 1979 - The American Pioneer Eleven passes the planet Saturn, becoming the first spacecraft to visit the ringed planet, albeit at a distance of 21,000 kilometers. October 6, 1979 - The Federal Reserve system changes its monetary policy goals from interest rate based to a money supply target orientation. November 1, 1979 - The Chrysler Bailout is approved by the federal government. A $1.5 billion loan-guarantee plan is floated to assist the third largest car maker in the United States. November 4, 1979 - The Iran Hostage Crisis begins when sixty-three Americans are among ninety hostages taken at the American embassy in Tehran by three thousand militant student followers of Ayatollah Khomeini, who demand that the former shah return to Iran to stand trial. 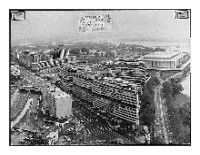 The Watergate Office Complex exhibit photo. Trial of June 17, 1972 burglary of the Democratic National Committee. Source: U.S. District Court for the District of Columbia. 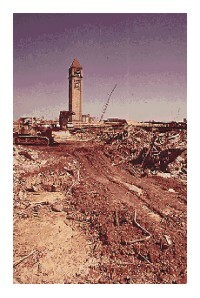 Construction on the site of Expo 74, Spokane, Washington, one year before opening. Theme to be the Environment. May 1973. Photo: Environmental Protection Agency. Camp David Peace Accord negotiated at the presidential retreat within Catoctin Mountain Park. Courtesy National Archives.